Denise Bissonnette is a highly acclaimed author, trainer, writer, and keynote speaker in the field of Employment and Training. As an impassioned advocate for individuals with barriers to employment, Denise has been inspiring audiences throughout North America for the past two decades with innovative thinking and practical strategies for helping people find their place in the world of work. Her first book, Beyond Traditional Job Development: The Art of Creating Opportunity is considered the definitive text in classrooms throughout the country, and often referred to as the job developer’s bible. Her celebrated book on job retention, 30 Ways to Shine, is championed in schools, job clubs, and utilized in a variety of workplaces and industries. 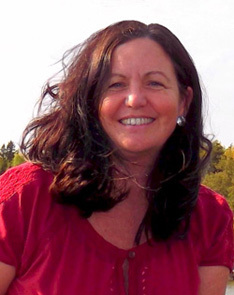 With her early work with refugees and immigrants, and her later involvement with persons with disabilities, Denise’s writing and teaching are infused with the substance and spirit of inclusion, invoking her audiences “to respond to the call and to be true to the dream of diversity”. With her book, The Wholehearted Journey: Bringing Qualities of Soul to Everyday Life and Work”, Denise broke new ground by bringing together her talents as poet, storyteller, and career developer, offering guidance and inspiration for anyone in the workplace to inhabit their job with a whole heart, a message that rings loud and clear throughout her presentations. 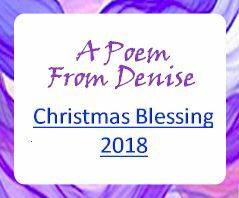 With a style all her own, Denise succeeds in weaving poetry and parables with highly practical and pragmatic applications, leaving her audience equally inspired and equipped to approach their work with renewed vigor and vitality. Denise received her Bachelor’s Degree in Linguistics from the University of California in Santa Cruz, California and her Master’s Degree in Multicultural Education from the University of San Francisco. 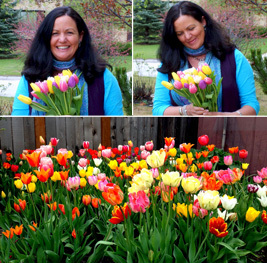 Denise resided in her beloved Santa Cruz for 35 years before moving to Winnipeg, Canada in 2006 with her husband, Rob McInnes, where she has learned to love the Manitoba spring and summers, and somehow survive the prairie winters. Her greatest joys include writing articles for her celebrated True Livelihood Newsletter, cooking and hosting gatherings for their large and extended family, and planning, dreaming of, and reveling in her spring tulip garden. 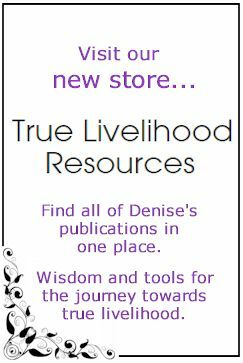 The True Livelihood Newsletter – Denise’s free electronic newsletter, offering readers a refreshing mix of practical tools and inspirational ideas. Published several times annually since 2003.